Welcome to the weekly Fightergirls MMA Insider column brought to you by your source for women’s MMA gear and clothing, Fightergirls.com. Here is the news for this week. The new women’s rankings are up with several debuts into the list. In the 145 pound division, the top seven places remain the same, with Shana Olsen making the list at #8. Yoko Takahashi dips from 8th to 10th, with Jamie Seaton moving up a spot to 9th. The 135 pound division remained unchanged. In the 125 pound division, the top six remain the same with Lena Ovchynnikova moving up a spot to 7th. Jeri Sitzes also moves up a spot to eighth, and Mika Nagano taking the ninth spot. Monica Lovato remains at ten. With Miku’s retirement, fighters have shifted around in the 115 pound division. Megumi Fuiji remains #1, with Mei Yamaguchi taking Miku’s spot at #2. #3 Yuka Tsuji, #4 Lisa Ward, and #5 Jessica Pene, all move up a spot. Kyoko Takabayashi leaps from #8 to #6, Jessica Aguilar remains at 7th. Angela Magana moves from 10th to 8th, with Saori Ishioka and Lynn Alvarez making the list at 9th and 10th respectively. You can check out the full list of rankings by visiting the Fightergirls Forums. The word from Stikeforce 145 pound champion Cris Cyborg’s camp is that she is expected to defend her belt at the June 26 Strikeforce card in San Jose, CA. Her opponent has yet to be named, but, it will be a non-American. A few possibilities include #5 ranked Japanese fighter Hiroko Yamanaka, #7 ranked fellow Brazilian fighter Amanda Nunes, or the winner of the Upcoming Glory 145 pound tournament German fighter Romy Ruyssen. Kerry Vera is out of her Strikeforce Challengers Portland May 21 match with Julianna “The Venezuelan Vixen” Pene due to a training injury. The match has been scrapped. In the only match this past week, Shoni Esquiro won a unanimous victory over Margarita Chavez in New Mexico. #8 ranked 125 pounder Angela Magana has pulled out of her May 25 title fight in Birmingham, England with #1 ranked 125 pounder and Cage Warriors champion Rosi Sexton due to an injury. Formally unranked Emi Fujino will be taking her place. #6 ranked 145 pounder Cindy Dandois announces she will have a match at the M-1 show in Finland May 29 vs. Sheila Gaff. Gaff was the runner up in the Upcoming Glory 145 pound tournament. The match will be streamed live on Sherdog.com. Valerie Coolbaugh announced she will face Iman Achhal May 22 in Fairfax, VA.
After saying she has been training MMA, Lisa Marie Varon (aka Tara) says she is leaving TNA Pro Wrestling and maybe pursuing a full-fledged MMA career via her MySpace. She is a big 145 pounder, but still needs some experience under her belt. Questionable knees have some critics wondering at the assertion. Varon had a small skirmish with Kim Couture late last year during a wrestling Pay-Per-View. Elaina Maxwell has dropped out of her title match with Raging Wolf champion and #10 ranked 135 pounder Alexis Davis in Niagara, NY this coming Saturday May. 8th. 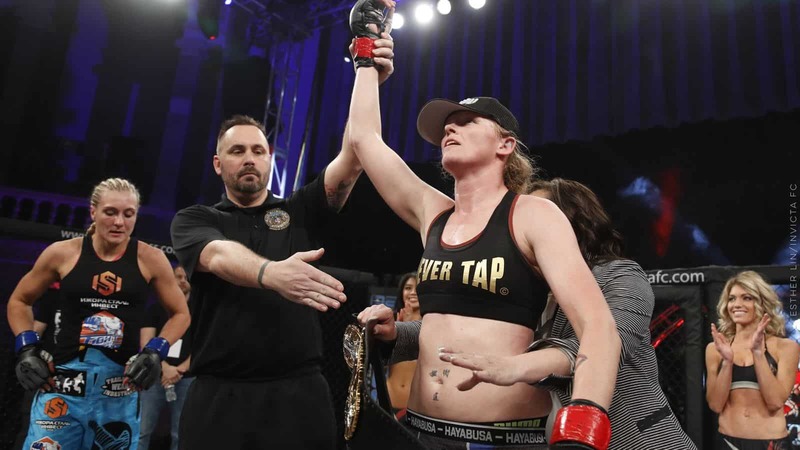 Formerly ranked Tonya Evinger will be making her return to the cage after a two year absence to face Davis instead. Crystal Stokes faces Elle Abbot at the PureCombat/HitMan Fights in Oceanside, CA and Christina Domke faces Sammie Rosado at the ECO 5 in Baraboo, WI. A reminder that Fightergirls will be at the UFC Expo in Las Vegas this coming Memorial Day weekend at the Mandalay Events Center, with interviews from some of the top women fighters in the world. Catch the live coverage by going to Fightergirls.com.